Though it may not necessarily be widely used on a daily basis, Nintendo Badge Arcade has been a fun extra on the 3DS. The free-to-download app - with various microtransactions thrown in - offers a chance to win badges through a simple crane game, which can then be used to spruce up the system's HOME page. The pricing on plays and related special HOME Themes can be considered a bit high, though, so some discounts are running to celebrate the one year anniversary of the app. In Europe the deal is simple - two free plays per day, half price on purchased plays, and by extension a free Theme at a cheaper price when you buy 10 plays for £0.90. In North America it's a bit different. The discounts end on 17th October, with two free plays still to come on 14th November (it's not a daily offer). It may be worth jumping in for free plays if nothing else, just to see that strange pink rabbit - it has a quirky character. A year already? Wow. And I forgot about this app 2 months after it released. I love this game, I play everyday. I have a ton of Pokémon badge to decorate my home menu of my Pikachu edition 3ds XL. All for free!!! Well...sometimes I check if there are some eye catching badges. I'm not really fan of it so I really need Free Play to get those for Free. There were also supposed to get 2 free plays in the US yesterday, I don't suppose there's any chance they carried over until today though. I really liked this game for a few weeks. 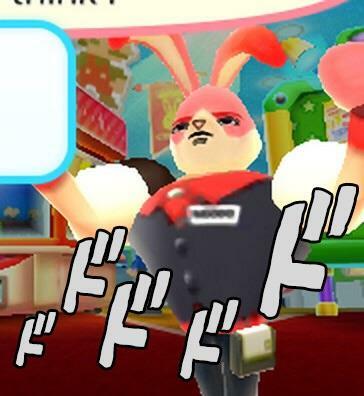 This should really have made this the mobile game rather than Miitomo, the rabbit Coindexter (the name we gave him, a play on Poindexter and coin b/c he works in an arcade) has a wonderful personality and he does a great job advertising other games and franchises every week. But the price was just way too high, like 500% too high. There are to many free games like this on mobile for it to be entertaining w/ only 1 free play per day and whatever they were charging for for plays. So 1/2 price really does make any difference, it's still way too high a price. Hopefully it will get on mobile though, like I said, great advertising. I have not used this in months. Maybe I will start today again. Eh, I already ended up spending more money than I meant to on badges that don't mean much. This game has too many annoyances for me to jump back into it. I've played this app every day - except for one - since it came out last year! I dread to think how much I've spent on the app over the course of the year... At least my home screen is absolutely covered in Pokemon and Animal Crossing badges! I gave up with it because moving icons on the home menu takes too long! It would have been great if Nintendo gave us the ability to select and move multiple items simultaneously! I really like this game! I still play daily, and have quite a good collection of badges now. I especially love the Luigi and Splatoon badges! I'm not tempted to buy plays from the sale, but I'll gladly take the two free plays! I like this game a lot; I decided to join the hype and buy 10 plays, netting myself the Mario Kart 8 theme! Nice! I'll be snagging some of those free plays. I actually really like this game... Good badges are rare, but those awesome Nintendo consoles ones go nicely on my various VC folders. I don't use badges for anything else but it appeals to my collector's nature. I've got about 1300 badges, and that's almost exclusively from free plays. I did pay a few times though, not gonna lie. Just wish there were some Sega badges... or at least one. I love and hate that rabbit at the same time. Love him when he does the boss voice while that beautiful music is playing, hate him when he tries hard to take my money. @Moon Yeah, I've used the pixel console badges on my VC folders. Just wish there was a NES one. The Famicon badge just doesn't seem right. At the moment I'm using an 8-bit Mario for my NES games folder. Some of the application badges are fun. I still play this daily for the free plays, but only had a short spate of spending any actual money. @rjejr I came across this article about the symbolism of the rabbit in Japanese culture that explains the choice of "Coindexter" in the game. There's an admission in that choice that the game knows it's partially a con and is poking fun at itself. Also explains the rabbit guy in that baseball game that Europe didn't get. The reference speaks to my sense of humour. I like the Rabbit, it's very cute. My tolerance of the rabbit ranges from "Heh, cute" to "JUST SHUT UP ALREADY!" It's okay for what it is, but by no means do I play frequently. I started playing it again and never stopped. I FINALLY GOT THE MOON!!! ...I only had to cave in and make my first in-game purchase, but I think the 50¢ was worth it. I named him Grabbit. I like that better. But I deleted this a long time ago. The badges didnt go away though. I first saw this game in Japan, then got interested but wasn't on EU 3DS yet. Soon after I came home 2 weeks later, they announced it for EU/NA. I downloaded it day one and played daily ever since. I spent about €30 on it past year to get the Super Mario Bros badges, but am now trying to get as many Pokémon badges as possible for free. Badge counter is almost at 1000! Just 10 or so badges to go! This game is VERY pushy about getting you to spend, or at least that's what I thought when I first installed it. I'm after the Isabelle badges, and OF COURSE they're the ones that take 5 consecutive plays to get. I try and play this at least once a week. Still a nifty five minute diversion.